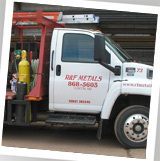 R & F Metals has been successfully providing builders with all their metal needs for over 30 years. Over that time, we have always worked to exceed the various needs of those we have served. This reputation has enabled us to earn the “Subcontractor of the Year Award” two times from the Maryland National Capital Building Association. We encourage you to contact us about how we can meet the metal needs for your project and see that we still live up to our hard-earned reputation -- delivering quality products with exceptional service.